On Wednesday May 5 the company hosted a 3 hour cocktail reception at their Fifth Avenue location. Over 70 top editors and stylists were invited for champagne and hors d’oeuvres to preview the collection and to meet the new President, CEO and Worldwide Creative Director Nicoals Bos. The latest Perlée collection is composed of 20 styles, the group features delicate rings, earrings and bracelets in rose or white gold and diamonds. Prices begin at $600 for a beaded band ring and go to $35,100 for a diamond pavé bangle. The collection will be available for purchase beginning in September 2010. 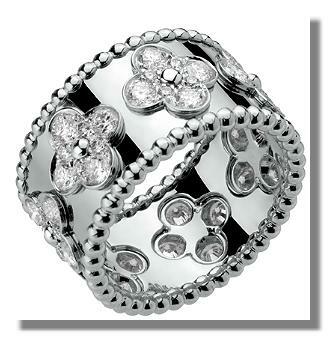 The company was founded in 1896 by Salomon Arpels and Alfred Van Cleef. They opened their first boutique in 1906 at 22 place Vendôme, Paris. Van Cleef & Arpels are renowned for their expertise in precious stones and have won particular acclaim for a groundbreaking gem-setting procedure known as the Mystery Setting.